Jimmy Fortel has built a beautiful microscale model of the Pantheon in Paris. 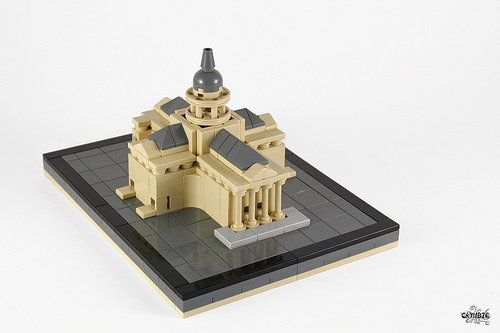 The color scheme makes this look like part of the official LEGO Architecture series – and I’m sure this great little build wouldn’t be out of place in the line-up. I really like the clean lines and deceptive simplicity of this creation, in particular the use of round 1×1 plates beneath the roof line, adding a nice touch of texture. The pillars at the main entrance are very good, and it took me a while to work out how they were built – the bottom of the pillars are round 1×1 bricks set into the model’s base. This is one of those models which surprises you with how long it can hold your attention, despite its small size.